Ahi tuna, also known as yellowfin tuna, is high in protein, low in fat, rich in omega-3 fatty acids and is best cooked when it has been properly defrosted. The best and safest method for thawing any food is in the refrigerator, as this prevents bacteria from forming on the surface of the raw food, thereby helping to eliminate the possibility of food-borne illness. Ahi tuna that has been defrosted in the refrigerator can remain in the refrigerator for up to two days before cooking, as well as be put back in the freezer. Thawing the tuna by the other two safe methods requires cooking the tuna immediately after thawing it. Remove the ahi tuna from the freezer and leave it in its tightly sealed packaging. If the packaging is not properly sealed, transfer the tuna to plastic wrap and wrap it tightly. Place the sealed ahi tuna on a dish to catch any condensation that results from defrosting. Put the tuna in the refrigerator and thaw it for at least 12 hours. Take the ahi tuna out of the freezer, unwrap it and transfer the tuna to a leak-proof plastic bag. Fill a large bowl with cold water and place the bagged ahi tuna in the bowl with the top of the bag out of the water to prevent water from getting inside. Thaw the tuna in the cold water for about one hour, changing the water after 30 minutes. Remove the ahi tuna from the freezer and unwrap it from its packaging. Place the ahi tuna on a microwave-safe plate and put it in the microwave. Thaw the tuna on 50 percent power for one minute. Turn the tuna over and defrost on 50 percent power for 30 seconds. Repeat defrosting on 50 percent power for 30 second intervals until the tuna has thawed. 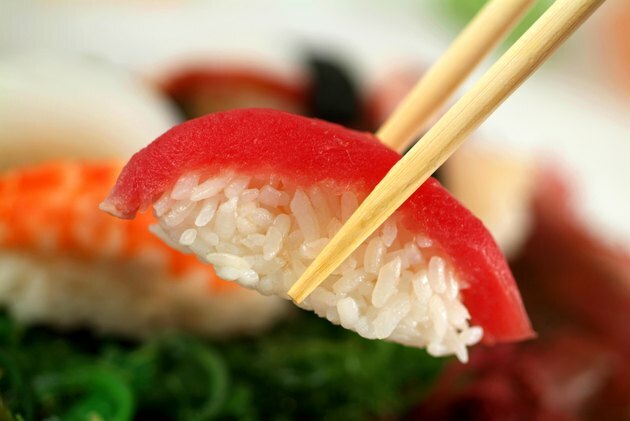 Do not thaw ahi tuna on the counter or use hot water, as this can lead to bacterial growth on the surface of the fish.